Art lovers, pull out your calendars and circle the first Saturday of every month. That’s when the Saratoga County Arts Council hosts See You on Saturdays, a “visual feast” of artworks from 5 to 8 p.m. in galleries and businesses all around town, complete with exhibition openings, wine and cheese, music, happenings, and the occasional artist in person. 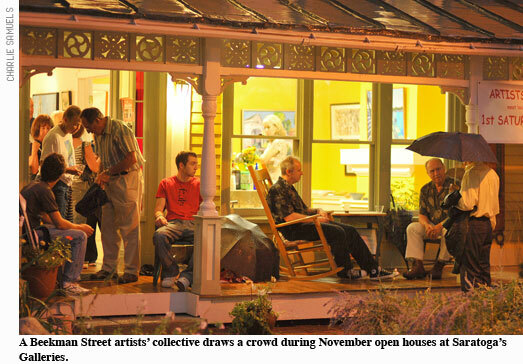 The open-gallery nights are part of a growing national phe­nomenon that seems tailor-made for this culture-happy city with its dozen or so art galleries and showcases. Drop in at a gallery to pick up a postcard-sized Saratoga Art Map, and for the price of a little shoe leather you can check out a broad palette of artworks in an array of media, price ranges, and artistic quality. During one SYoS last fall, we took in four galleries downtown and three more in the Beekman Street art district, sampling the priciest and the cheapest art in town. We didn’t even get to all the shows. So much art, so little time. Here’s just some of what we found. The smallest place on the map was the new Sorelle Gal-­lery on Phila Street. Measuring eight feet by twenty-five feet, the sophisticated white-walled gallery with its arching brick ceiling was once part of a nineteenth-century bank vault. Its forte—“traditional fine art by local and international contemporary artists”—was exemplified in works by Peruvian-born painter Yvonne Mora, whose handsomely gilt-framed paintings were a riot of color splashed across beaches, clubs, and street scenes. The largest art space in town, housing two galleries, was the entire second floor at 462 Broadway (over the former Mabou store). Gallery 100 had invested its half of the spacious, gracious floor-through in a handsome show called Art Horses, including painter William Brian Hibbard’s beautifully real horses on imaginary mixed-media backgrounds and Erik Johnsen’s carved-wood sculptures, most notably a gorgeous and nearly life-sized zebra in half-gallop. Sadly, that particular Saturday was Gallery 100’s last hurrah as a public gallery before switching to an art consultancy. Across the hall from the horses, Frankie Flores’s studio displayed witty wooden pieces by Mexican sculptor Merco Abarca and racehorse paintings by ex-jockey Nick Martinez. Among Flores’s own exuberantly colored paintings were a vivid lacquer-red polo pony and rider rendered in paint that was dripped, Jackson Pollock­–like, onto a jet-black canvas. “Pollock with a plan,” suggested a gallery attendant. On Saratoga’s West Side, 79 Beekman was a hive of activity, a sort of potluck party for the fourteen artists working in the old house’s warren of studios. Pride of place was given to a series of oil paintings by Trudi Smith, including expertly realistic portraits like Thomas (a finely weathered old face, red cap, lopsided eyeglasses). Visitors tramping up and down the narrow stairs couldn’t help but bump into friendly artists. Among them was Tang Museum monitor Pat Goodale, wearing a T-shirt of her own design: a Beekman Street signpost in vibrant primary colors.